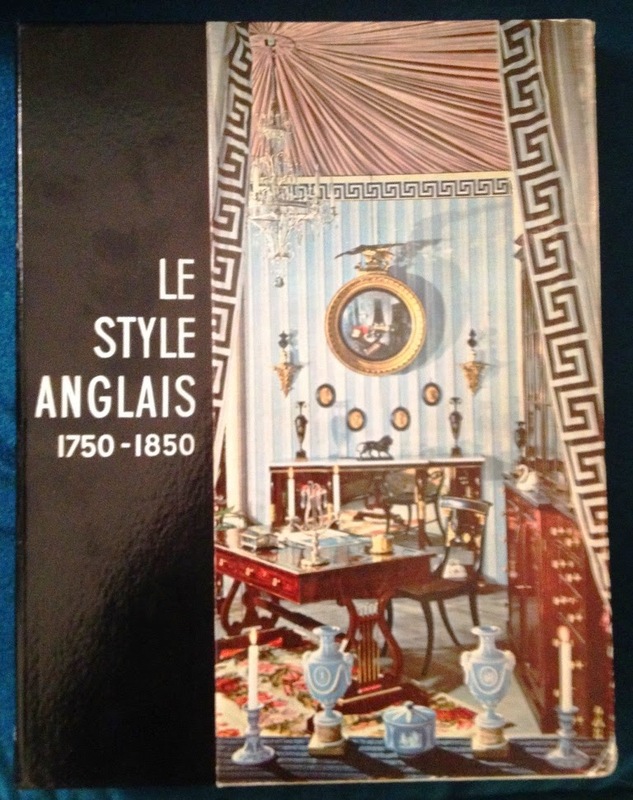 I was first introduced to the work of Parisian decorator Raoul Guiraud thanks to the cover of Le Style Anglais, 1750-1850. 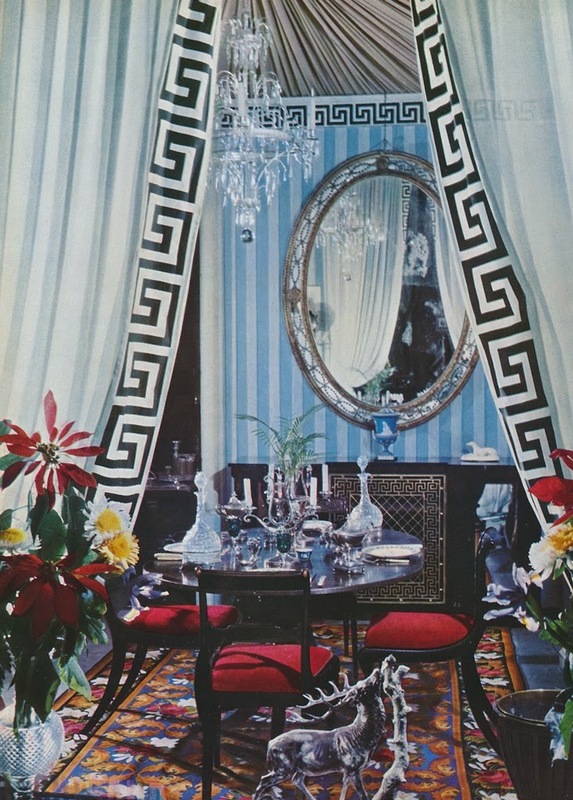 I admit that I purchased the book solely because of its cover, which featured a Guiraud-decorated dining room adorned with blue and white striped walls, a tented ceiling fashioned from grey fabric, and eye-catching Greek Key trim. Although I suspect that there might be some who find this room to be garish, I find it oddly appealing. 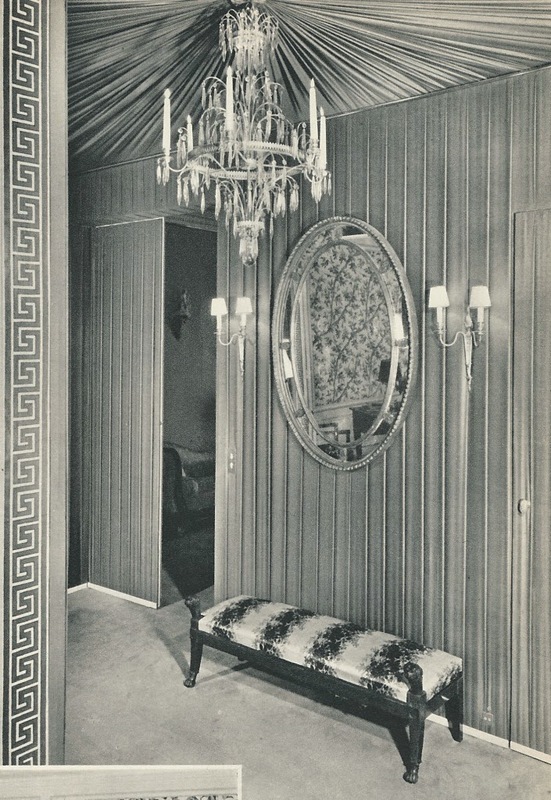 Could that bold Greek Key trim and tented ceiling be responsible for my mild infatuation with this room? 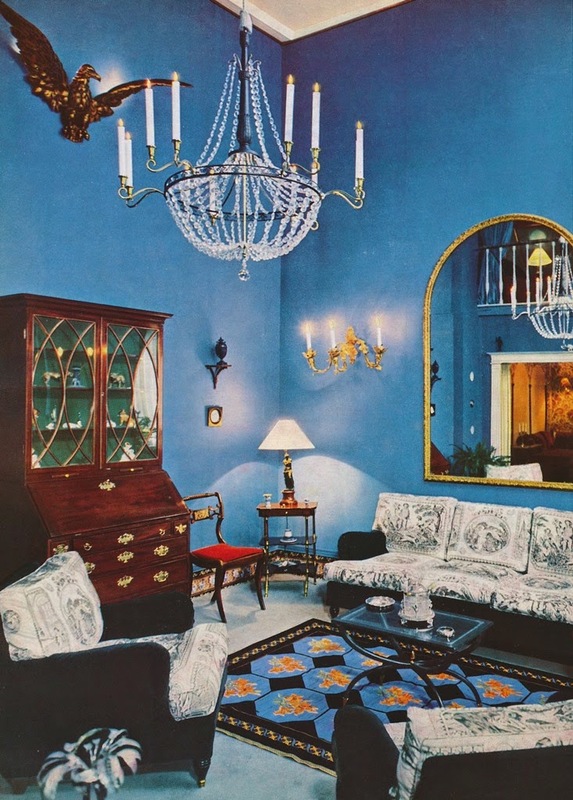 It was fitting that Guiraud's work was featured in Le Style Anglais, because like a number of mid-twentieth-century French decorators, Guiraud found inspiration in the English style, especially Regency furniture and decorations. 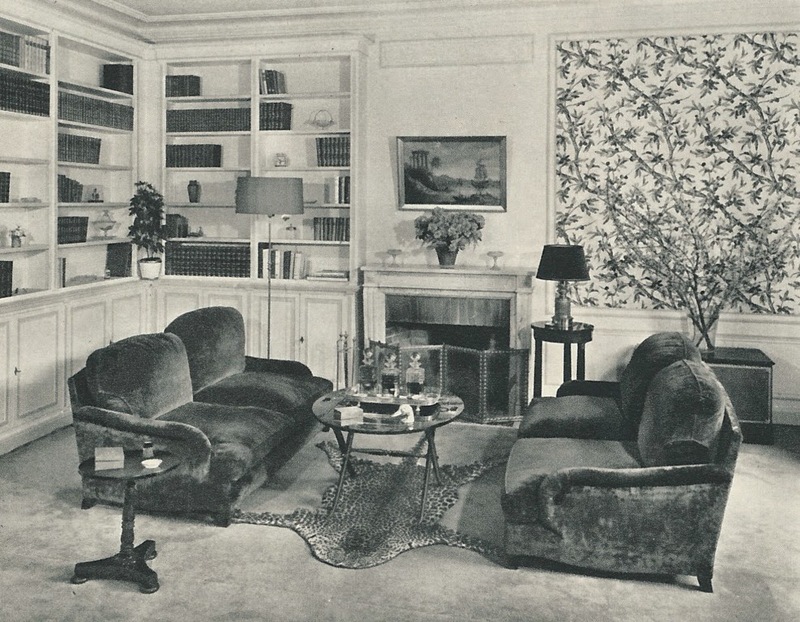 As the book's editor, Francis Spar, noted, "When it comes to decoration, the marriage of English comfort with French taste is quite possibly the most important event of the mid-twentieth century." But much of the credit for this Franco-English mash-up has to go to Madeleine Castaing, who more or less made le goût anglais de rigueur in France. 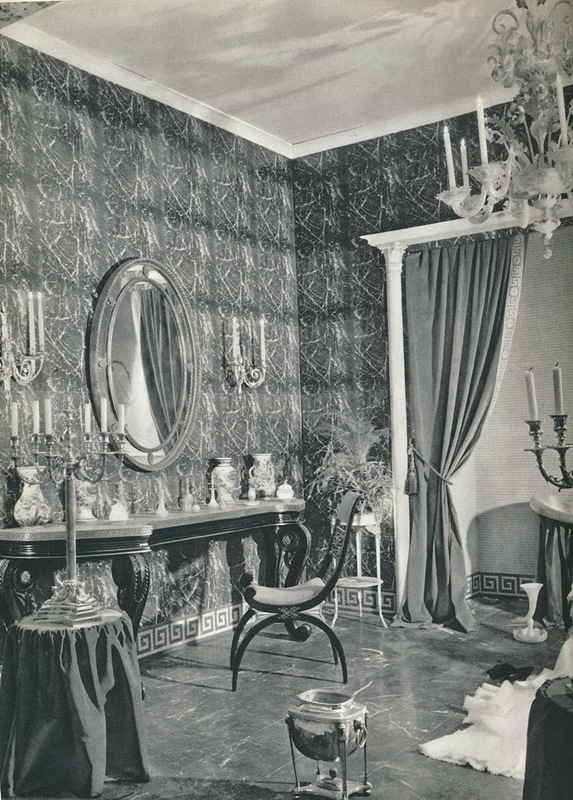 According to Emily Eerdmans, author of The World of Madeleine Castaing, "Madeleine was widely credited with bringing the English Regency style to Parisian salons." And, when discussing the influence that Castaing had over her contemporaries, Eerdmans included the work of Raoul Guiraud, who the author describes as "one of the most prominent followers of the le goût anglais craze Madeleine initiated." When you look at photos of Guiraud's work below, you will notice that in addition to Regency Style flourishes, elements of the Empire and Directoire styles also seasoned the designer's work. 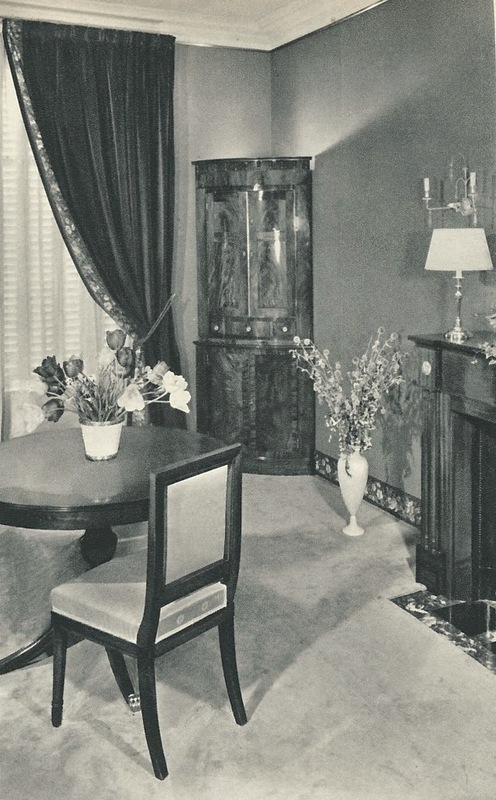 Guiraud's enthusiasm for all three styles explains his predilection for Regency furniture, tented rooms, and, most especially, the Greek Key motif. Simply put, the man was crazy for a Greek Key border. And finally, it seems that Castaing's influence extended to Guiraud's choice in fabrics. In two of the rooms below, you'll see what appears to be two different Castaing fabrics: Branches de Pin, a black and white arborous print; and Rayure Fleurie. Two different views of the tented dining room, both of which appeared in Le Style Anglais. 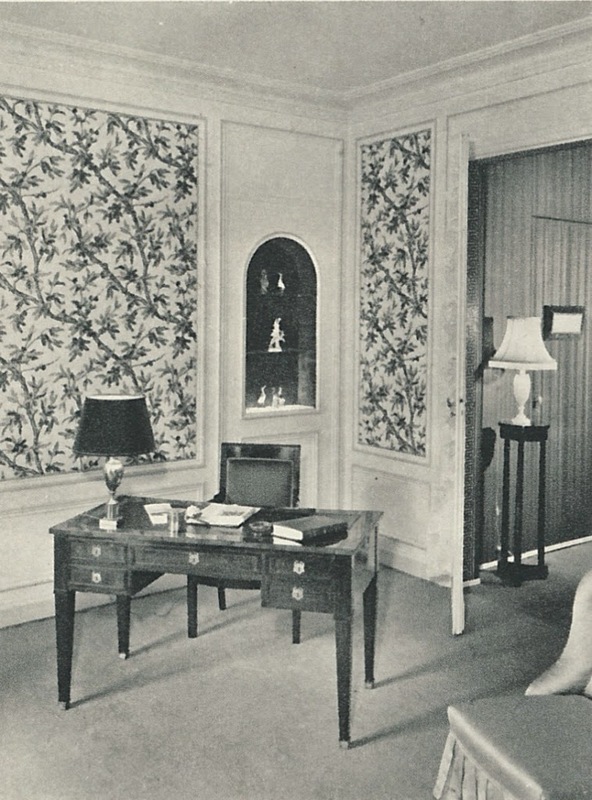 Also appearing in Le Style Anglais was this Guiraud-designed room. Note the gilt fillet trim at the top of the walls and the floral wallpaper border at the bottom. 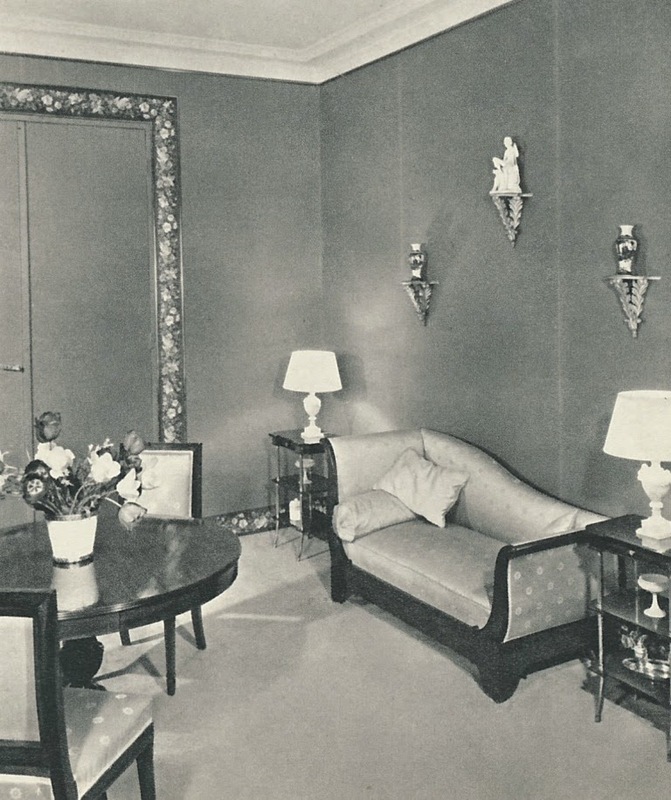 In this Paris apartment, which appeared in Comment Decorer Sa Maison, Guiraud tented the entry hall in yellow satin. I believe that the bench fabric is Castaing's Rayure Fleurie. Of course, you can't help but notice yet another Greek Key border. 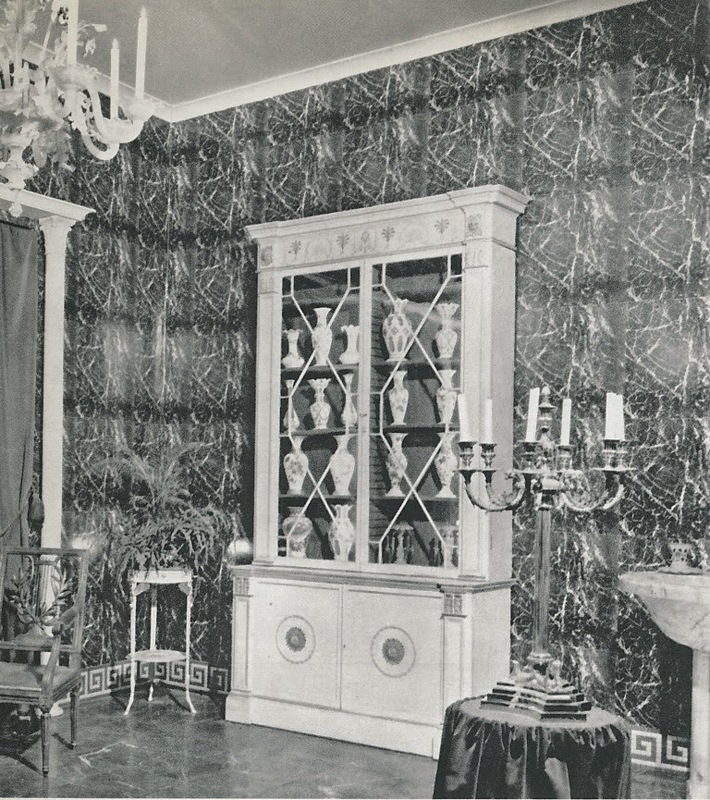 In the same Paris apartment, the library's paneled walls were enlivened with a black and white print fabric, according to the book's text. I believe the fabric to be Branches de Pin. 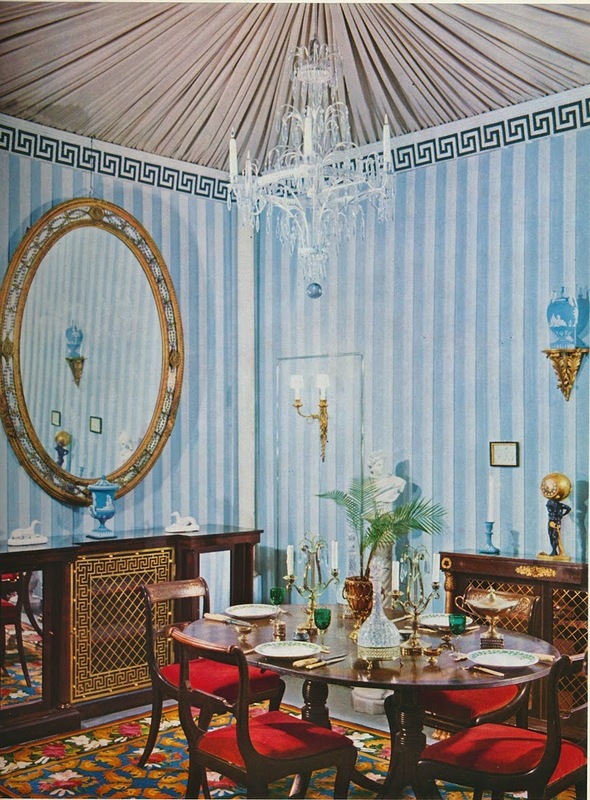 The apartment's dining room had blue walls, according to the book. The floral wallpaper-border baseboard looks awfully similar to the color photo that appeared in Le Style Anglais. I wonder if it's the same room. I find this Regency-style bathroom, which was decorated by Guiraud, to be rather extraordinary. 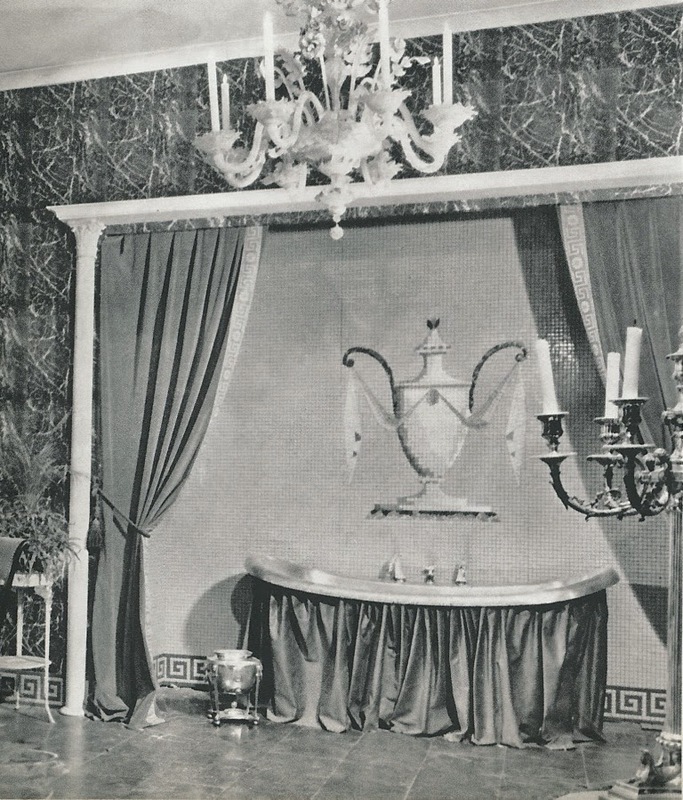 Look at the tiled bathtub alcove, which was framed by slender columns, and its Greek Key border and overscaled urn motif. And what about that skirted bathtub?! Hello Jennifer, I am impressed with the light touch of Raoul Guiraud. This seems to come though his use of relatively uncluttered walls, as well as his employment of Classical objects and themes. These features make the dramatic introduction of color and fabric all the more impressive. Gorgeous and very inspiring! Miles Redd and Mary Mcdonald come to mind when I see these rooms. Perhaps they have been inspired by the book? Ill have to see if I can find a copy. To me, these are very sterile rooms - not at all English. Gorgeous rooms Jennifer. I do love the Greek Key border at the baseboard as opposed to the florals. Such a chic throwback! Love it! How does one even get into that tub?? Such beautiful retro rooms. Tres tres chic! I am a big fan of the work of Raoul Guiraud, clearly one of the most chic decorators of his day. In the bathroom, the walls appear to be covered in squares of marbled paper, each with the same repeat of pattern. While I would have preferred painting the walls to resemble selected slabs of veined marble, the choice of paper was undoubtedly the designer's preference as economy does not appear to be a factor. And Greek Key is always a welcome motif.